Jarp performs variable-length Jarvis-Patrick clustering based on fingerprints and/or other data stored in a database table or a file. The software can also be used for calculating diversity measures, like average and minimum dissimilarity of a compound library. 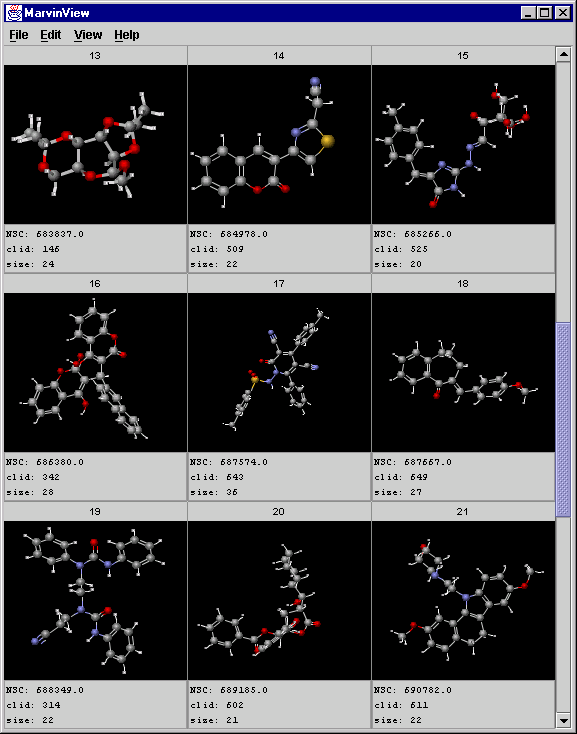 This document mentions molecules as the entities to be clustered, but the software can also be used for other types of objects. Calculate the set of K nearest neighbors for each structure. Note that the structure is set as its 0th neighbor. they have at least Kmin of their K nearest neighbors in common. For each structure, collect the set of nearest neighbors that has a dissimilarity (distance) less than a T threshold value. Nearest neighbors of equal similarity to others already in the list maybe excluded because the list already has K elements. This may subdivide large clusters consisting similar molecules. It has the tendency to produce too many singletons, because in many cases similar structures have less than Kmin nearest neighbors in common. Molecules in sparsely populated areas tend to cluster together. The application of variable-length lists solve the above problems. where NA and NB are the number of bits set in the bit strings of molecules A and B, respectively, NA&B is the number of bits that are set in both. where T(A,B) is the Tanimoto coefficient for molecule A and B.
Ci(A) is the value of descriptor i of molecule A. Instead of the brute force method, Jarp applies heuristics to avoid calculating all pairwise dissimilarity calculations and neighbor list comparisons. According to our measurements, the speed of clustering is O(n1.5). Prepare the usage of the jarp script or batch file as described in Preparing the Usage of JChem Batch Files and Shell Scripts. -f  --fingerprint-size <bits> binary fingerprint size in bits. 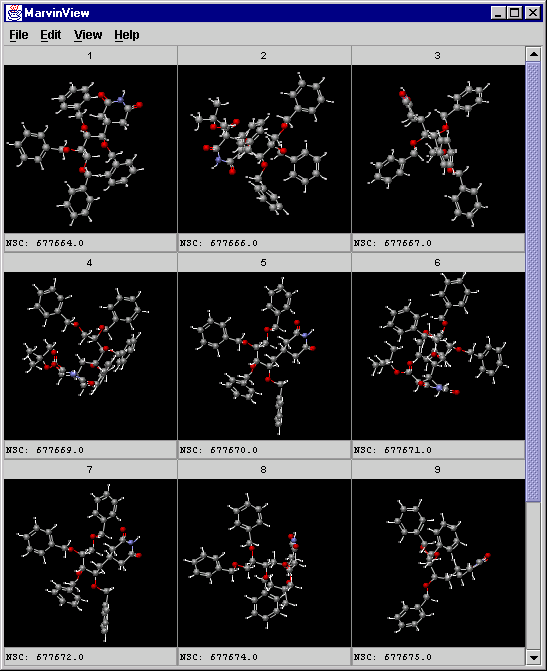 -g  --generate-id             generate id for each compound. Pharmacophore fingerprints can be generated using the GenerateMD tool. These fingerprints are not binary, so they have to be specified as other descriptors. See an example for combining GenrateMD and Jarp. For the sake of readability only 6 fp. columns is applied in the above example, but usually this number is much higher. You may also modify the order of the results by appending " ORDER BY CD_ID" to the SQL query. Before clustering, make sure that the table is empty. The SQL DELETE statement may be applied for deleting the rows in a database table. The central column is 1 if the object is central, 0 otherwise. --dimensions Specifies the number of other columns. If only binary fingerprints are used in the clustering process, then this parameter doesn't have to be set. --weights When other columns are used, a weighted Euclidean distance calculation may be applied. If there are also binary fingerprint columns, weights are relative to the Tanimoto coefficient calculated from the binary fingerprints (the Tanimoto coefficient has a weight of 1.0). --threshold Same as T in the Introduction. The higher the threshold the longer the lists of neighbors that has to be stored in memory for each compound during clustering. Too long lists of neighbors can cause memory problems. --common Same as Rmin in the Introduction. JChemManager saves the modified settings that needs for the database connection. If you successfully entered into the database using JChemManager, then you don't need to set connection for Jarp manually. Setting the minimum proportion of common neighbors (--common option) correctly, is important in fine tuning the clustering process. Since nearest neighbor searching is much more time consuming than the clustering stage, it is reasonable to separate the two processes. In that case clustering can be run several times with different --common settings. nneib is a command line application that collects and stores the nearest neighbor list in a text file. If this file is fed into Jarp, the nearest neighbor search is omitted. NNeib has the same command line parameters than Jarp, however, the --common , --statistics, --only-statistics, --singlet options are not available. for help on input parameters.